You Didn't Know Harry Potter Was Jewish? 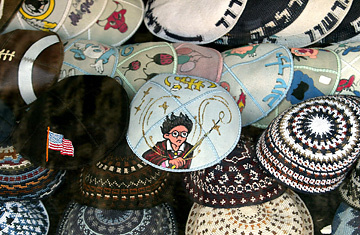 A Harry Potter kipa, or yalmulka, for sale in a shop along Jaffa Road in Jerusalem. Adam Melech is from California, but his temporal home, today, is the Galilee town of Safed, home to stoners and Sufis and people like himselfsomewhat ecstatic Hasidic mystics. Separating himself from the whisky-fueled merriment all around, he takes me aside to share something important: "See this wedding?" says Adam, gesturing to the gathered crowd. "This is like Bill and Fleur's wedding." Bill and Fleur? From Harry Potter? "That's right. Almost anything you need to know about Jews, you can learn from Harry Potter." It might have been the jet lag, or the Bushmills, or the fact that I don't sing and can't dance, but my cousin's wedding, in an artists' colony in western Galilee, had left me feeling a little disjointed. Like most clean-shaven agnostic half-Jews, I get slightly nervous around Hasidim, perhaps because we can't both be right about life. And though my cousin is of mixed-blood, like me, and was never particularly religious, his wedding guests included real-deal Hasids: Ultra-Orthodox men chanting and praying and rocking back and forth, in their fedora hats and tzitzit strings hanging around their waist. Most of them, it turns out, are Americans who weren't even born into Hasidic families. (They call themselves bal-chuva "those who return" to the faith.) Emboldened by drink and by their warmth, I take the opportunity to ask the questions I'd always wanted to ask about Hasidism: What is it like? Why the clothes? I don't quite understand some of the more thoughtful answers about the second coming of Moses and Rabbi Nachman of Breslov. But I know Harry Potter, even if I never saw its Jewish significance. Adam moves to enlighten me, offering an amazingly complete dual cosmology of Harry Potter and the Chosen People. Jews, he explains, are the wizards. The non-Jews are the muggles. And Israel's wizards are engaged in a kind of invisible spiritual warfare (just like in Rowling's books) that most muggles can't even see, much less understand. Rowling may be a muggle, says Adam, but she knew what she was doing. Why else would a yeshiva like Hogwart's be so central to their lives? Why would the power of naming and names be so important to both Jews and wizards? He offers further corollaries: Harry's spells are talmudic prayers; Hizballah are the Death-eaters; converts to Judaism are muggle-born wizards; and so on. He breaks the news that I'm actually just a mudblood  a muggle, not a wizard, because my muggle mother had converted to Reform Judaism, not Orthodox. But I shouldn't despair, he says. There are good muggles and bad muggles, just as there are good and bad wizards. I could still play a (somewhat diminished) role in fighting evil. "Jesus," I answer. "This is all pretty heavy." He winces. "Whoah! You said it." "Oh, I get it. Jesus: he who must not be named." Adam winces again, but nods. I'm getting the hang of this. We have another drink. A couple of days later, I called Rabbi Dr. Chaim Pollock, Dean of Foreign Students at the Michlalah Jerusalem College, whom I had read had also used the Harry Potter analogy. He seemed somewhat embarrassed that I was asking him about the topic. "Harry Potter is fiction," he said. He had never suggested that it spoke to the Jewish experience specifically. He had just defended its emphasis on good and evil back when a lot of religious leaders were denouncing the books as occult. "The following, I think I can tell you," he said, warming slightly to the topic. "Rowling is an astute observer of society. [Hasidim] have their inner truth, and inner logic," just as Rowling's world does. Rabbi Pollock was cautious, of course  likening an ancient religion to children's fiction may not be particularly prudent in a country that is home to more holy sites and razor wire than anywhere on earth. But here in Galilee  where Druze and Arab villages perch on the same scrubby ridgelines as Jewish towns, all within easy reach of Hizballah rockets, and the region's peoples continue to squabble over the mantle of historic victimhood  young Americans committed to God and Zion may find comfort in a world of Death-eaters and wizards. Bill and Fleur's wedding, you may recall, was attacked by deatheaters. But this wedding night was uneventful  even the lights of the Druze and Arab villages twinkled benignly in the hills. At one point in the evening, a gregarious Lubavitcher named Shalom Pasternak, who sings in a band he created with my cousin called Kabbalah Dream Orchestra, was helping my cousin dispense shots of whisky and blessings to his friends and family. With his beautiful bride, and  let's face it  some fascinating friends, he was every bit the Half-Blood Prince. We were all glad to see it, wizard and muggle alike.